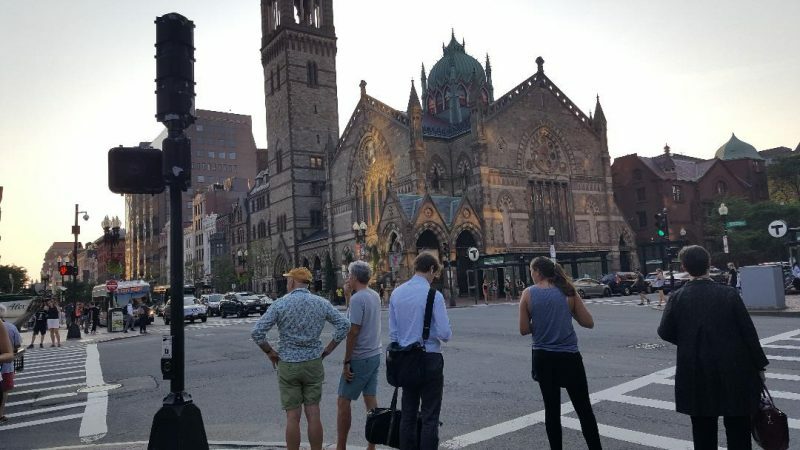 On August 6, three Tri-City members braved the heat and traffic and made their way to the Old South Church in Boston for the chance to sing some Brahms with Chorus Pro Musica in their first “Summer Sing” of the season … and it was worth it! CC Clapp, Robin Gratiot Vaughan and I paid a measly $10 apiece to join singers from Chorus Pro Musica as well as other choral enthusiasts like ourselves for almost three hours of working our way through two Brahms songs, under the inspiring direction of Jamie Kirsch, CPM’s musical director. Snacks and scores were provided. Speaking for myself, within 20 minutes or so I was “in the zone”…you know, that place where you’re so fully engaged with taking apart, exploring and piecing back together a new piece that nothing else exists. Jamie Kirsch made us feel like we’d been working with him for … well, all along. An added bonus for me: a young woman came over to introduce herself to some of us during the break. When I told her my name, she exclaimed, “Are you Joyce Hollman from Tri City Community Chorus?” Whoa! Was I famous? No … in fact, I was talking to Tori Cook, president of CPM, but also someone I’d been emailing with about an online management system for choruses called Chorus Connection (more about that another time). Tori is an expert in fundraising for choruses, and I have some conversations planned with her … stay tuned! There are two more summer sings coming up, on August 13 and 20. Why not expand your choral horizons and give it a try?